When we look at a cottage, we might admire the architecture, or recall good times spent there, or think about future renovations. When mice look at a cottage, all they think about is how to get in. It’s not just mice that view the cottage as a box to be opened: carpenter ants, spiders, wasps, raccoons, squirrels, skunks, woodpeckers and bats are all keen to come indoors, and become even more so as the winter approaches. Ants, wasps and other insects, of course, can enter through even smaller holes. It’s impossible to find every possible access point, he notes, but a walk-around inspection is an important first step. The experts will also look for clues that pests have already entered the building. “You may not be seeing many ants in the house, for example, but there are telltale signs that they’re present, if you know what you’re looking for,” Mark says. To really stay on top of pests, a bi-annual inspection and preventative service is the best way to keep small problems from becoming big ones. If a problem is identified, pest-control experts will be able to recommend the best treatment. 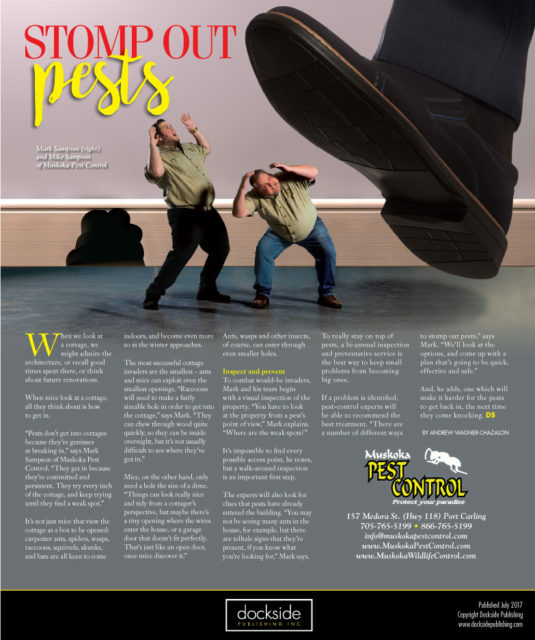 “There are a number of different ways to stomp out pests,” says Mark. “We’ll look at the options, and come up with a plan that’s going to be quick, effective and safe.” And, he adds, one which will make it harder for the pests to get back in, the next time they come knocking. With almost 30 years in the industry, Mark brings a wide scope of experience and knowledge to both his customers and staff. 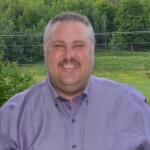 Mark holds several licenses and has previously sat on the board of directors of the SPMAO both as a director and vice president. He is also a registered examiner through the PIC (Pesticide Industry Council).